Little J loves to point out every bike he sees, so he will be thrilled with today’s activity we have planned. This annual race has become the largest road bicycle race in Saskatchewan and one of the largest in western Canada. 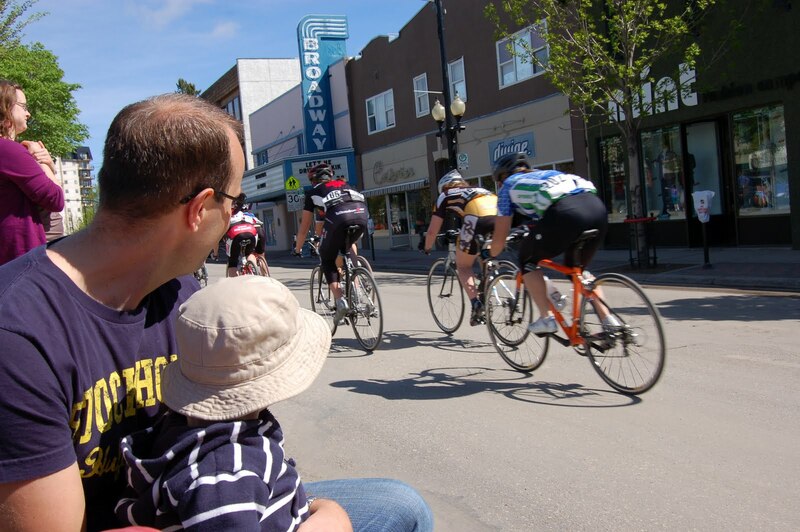 Always held on the May long weekend, the three-day Bikes on Broadway race has become an institution for local cyclists as well as competitive cyclists throughout the prairie provinces. It is also can be an exciting event for little onlookers. Riders with colourful bikes and gear will be racing around the rectangular loop that includes Broadway Avenue, Main Street, Dufferin Avenue and 11th Street East. Click here for a map of the course. It’s also not too late to register your older children in the Kids Crit. Kids 12 and under with bikes of any kind can participate in the 11:45 a.m. race. Registration will be from 11 to 11:30 a.m. The entry fee is $5.